WHEN THE SALVATION DOOR CLOSES! It is my view the Lord will not return UNTIL the last person named in the “Book of Life” has said “yes” to Jesus. But when will that be? For one thing, it seems certain that when the Lord appears in the sky and descends to earth, He’ll be bringing every believer with Him! He is “coming with all His saints,” says the apostle Paul (1 Thess. 3:13). It’ll be quite a crowd. The entire church gathered out of all the ages, the entire family of God. From this fact an awesome truth emerges—no one will be saved AFTER the Lord returns in glory! That’s a shocker, isn’t it? Especially when we know more than 1000 years of human history remain. Let’s begin with Jesus’ parable of the wise and foolish virgins (Matt. 25:1-13). I won’t repeat the story, but simply recall that five of the ten virgins were prepared for the bridegroom’s return and five were not. When the bridegroom returned unexpectedly, those who were ready went into the feast with him, and those who were not ready, were barred from entering. Then came those terrible words—“The door was shut” (vs. 10). Consider that shut door. Consider also when Jesus gave this parable. His disciples had just asked when and how He was returning. Without a doubt, the purpose of the parable was to teach the believer’s readiness for Jesus’ second coming. This is something people MUST be ready for. If not, they’ll find that door slammed shut in their faces! 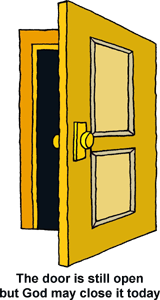 The Bible gives no hint that door is ever opened again. And that is my biblical basis for saying salvation is no longer possible or available after the Lord Jesus appears in the sky! Thus, one must conclude the Lord will NOT RETURN until the last person listed in the Lamb’s book is in the fold. 1. As I mentioned, the Lord will not return until the last man is saved. The last man, that is, named in the Lamb’s Book (Phil.4:3; Rev. 3:5). In that moment the “Body of Christ” will be complete and the DOOR will be shut! (Matt. 25:10). 2. The Spirit’s sealing work ends when Jesus returns. Why? We are sealed UNTIL the day of redemption (Eph. 1:13,14). That is the day Jesus returns (Rom. 8:23). 3. It is Jesus’ work as the Spirit Baptizer that places people in the “body of Christ” (John 1:33; 1 Cor. 12:13). The instant Jesus returns in the flesh, His ministry as the Spirit of Christ ends. From that point on, no one can be baptized into the “body” (God’s family). How come? 4. Salvation is by faith—yet when Jesus returns, everything is BY SIGHT (including the Millennium). No longer will people be able to place their faith in an unseen Lord. Faith is not possible says the apostle Paul, once Jesus can be seen with the naked eye (Rom. 8:24). And certainly not possible when He returns in power and glory (Matt. 25:31; Rev. 19:16). 5. Very clearly the millennial choice is not a choice for salvation. Its purpose is to prove that God was just in making salvation by faith rather than by sight. The SIGHT METHOD failed in the FIRST EDEN and it will fail again in the LAST EDEN. For after 1000 years under the reign of Christ, the nations of the earth will flock to Satan once he’s released (Rev. 20:7-9). This deliberate choice on their part will show that God was perfectly right in CLOSING THE SALVATION DOOR the day Jesus appears in the sky! You and I live in the amazing age of the Holy Spirit. During this age, Jesus literally indwells believers via His Spirit (John 14:20,23,26; Acts 2:1-4). Once the Lord returns in a body, He will no longer be available in the Spirit. Thus, no one will be able to “receive” the Spirit, making this age the only time a person can be saved. “It is expedient for you that I go away; for if I go not away, the Comforter will not come to you; but if I depart, I will send Him unto you” (John 16:7). Do you see what that means? Jesus cannot be on earth in a body and be in our hearts as the Comforter—at the same time! He had to go away before He could return in the Spirit. Now the reverse of that statement is also true. When Jesus returns, the Comforter can’t stay. This means no one will be able to receive the “Spirit of Christ” and “partake of the divine nature” after that (2 Peter 1:4). No one will ever again receive the righteousness needed to live with a holy God. So how can people be saved after Jesus returns? They can’t. It seems that if people can’t be saved except by faith—and faith clearly ends when Jesus appears, and every eye can see Him—then the case has been made (Rev. 1:7). The apostle Paul warned us to expect terrible times before the Lord returns. Those times are all but on us now. So you’d better enjoy your warm bed, hot shower and full stomach as long as you can. You may think America, which has been so abundantly favored by God, is immune to judgment. But this nation has all but turned its back on Him and He has little reason to spare it now. The Lord Jesus spoke of this time when He said those who kill us will think they’re doing God a favor (John 16:2). Believe me, the Scripture is clear on this. God is going to really shake this world in preparation for His Son’s return. Devastation will be everywhere. The carnage will be horrible (Heb. 12:26-29). How prepared are you? We need to be prepared for Jesus’ return. Do you know what to expect? Do you have yourself and your family ready? Being ready to stand before the Lord in that day is the one thing. 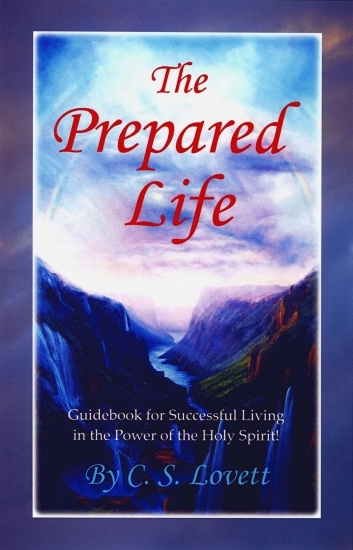 . .
For more information on how to get you and your family ready for the Lord’s appearing, read Dr. Lovett’s book The Prepared Life, available now on Amazon.com HERE. Some bookstores can order it for you if you don’t have the internet. “It was faith that kept the prostitute Rahab from perishing along with the disobedient people of her city. Her faith was clearly manifested when she welcomed the Israelites as friends” (Heb. 11:31 Lovett’s Lights). 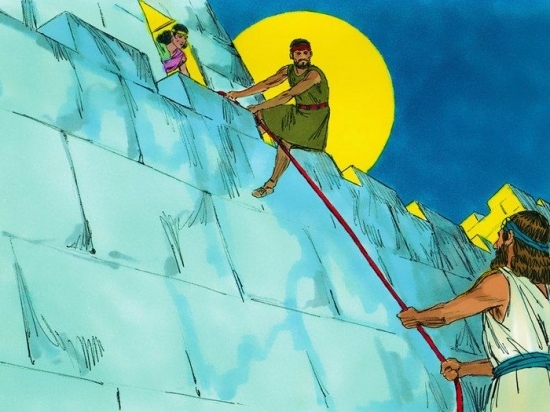 Here is one of the most surprising personalities in the hall of fame—Rahab. A Gentile woman who was a prostitute and betrayer of her country is listed here because she told a lie—by faith. Had she not lied, we would never have heard of her. When Joshua sent spies to scout out the military situation in Jericho, they took lodging in Rahab’s house. Somehow their presence was discovered, and the city officials sent soldiers to Rahab’s house to seize them. But the prostitute hid them, lying to the soldiers as to their whereabouts. After that, she helped them escape from the city. The only thing she asked in return was that she and her family might be spared when Jericho fell to the Israelites. The people of Jericho had heard of the mighty deeds of the Israelites (Red Sea crossing and destruction of the Egyptian army), but only this woman interpreted them as being done by the God of Israel. Of her own free will, she elected to put her faith in Him. To the spies she said, “I know the Lord has given you the land!” What a remarkable statement of faith. She made this prediction when the downfall of Jericho seemed impossible. She went on to say, “The Lord your God, He is God in heaven above and earth beneath” (Joshua 2:9-11). Not only did this woman confess her faith in God Who could do the impossible, but backed that faith with works, risking her life to save the spies. The result: She and her family were the only ones spared out of all the inhabitants of Jericho. By faith she joined the people of God and married Salmon. She became the mother of Boaz which makes her an ancestress of the Lord Jesus. This woman was far from great in the eyes of the world for she was a prostitute, a betrayer and a liar. But in the eyes of God, she was great enough for His hall of fame! That’s the difference faith makes. Excerpt taken from the book Let Your Spirit Soar by C. S. Lovett, Copyright © 1994 by C. S. Lovett. All rights reserved.